Too often today's shooters are all too likely to put a high powered scope on a rifle that does not need that level of power. It may not need the power due to ballistics or purpose but we will go into that later. The truth is, with a little skill, the best 1-6x scope can be a great choice for far more rifles than most people realize. If you are new to shooting, getting a lower powered scope can be a virtue in teaching you proper fundamentals. If you are a veteran shooter, lower magnification increases field of view, makes target acquisition a moderate ranges better, and is far faster than a more powerful optic. For tactical situations, this makes the 1-6x scope an incredibly good choice. No matter your reason, let's look at what you need to consider before diving in. Because we are looking at a very specific subset of optics, there are a lot of the normal points that can be bypassed. Since we know we are looking for a smaller variable scope, magnification is not an issue. Neither is the all-important objective lens diameter. Instead, we can focus on the platforms these scopes may be used for and get into the real nuts and bolts. There are a lot of uses for a lower powered scope. You can often find them mounted on small caliber rifles for medium range, many hunters use them on shotguns, and they make a great little tactical scope. Any of these uses are viable but you need to get the right scope for the job. On small caliber rifles, the choice of scope can be just about anyone you want. There are not any additional considerations. It is unlikely that you will need much in the way of bullet drop compensation and eye-relief is a non-issue. Calibers up to and including the .223 could be considered small bore. A small scope on one of these rifles has a lot of versatility from hunting to home defense. Many deer hunters use these scopes on lower ranged deer rifles like the .30-30 and .45-70 and even on slug guns. If you are looking for a scope for something like this, make sure you have the eye-relief necessary for your own safety, usually around 4 inches. For lower powered rifles, any eye-relief will do just fine. For a tactical rifle used for home defense, these are one of the better choices if you don’t want to go with a red dot optic. Smaller scopes, either for AR-15 or for Scar 17 rifles are becoming increasingly common. They make shots at medium range easier and quicker while still being usable in close ranges. If you plan to use a small scope for a tactical rifle, the 1x6 is probably the best overall choice. Most any decent scope will work just fine. Just about every possible reticle that comes in an optic is available for these lower powered scopes. You can get simple crosshairs, full BDC reticles, and even shapes like chevrons and circles. While all of these do tend to work quite well, some people shoot better with one over the other or have preferences. There are some strengths and weaknesses but most of the time these are not that significant. These basic, old school reticles work very well for those with small caliber rifles intended to shoot very precise targets. They also work well with hunters who want simple gear that they don’t have to overthink when the moment comes. When it comes to tactical applications, these scopes are best at increasing your range more than anything else. This may be somewhat limited usefulness in most home defense situations but it can provide you an edge and they are good at taking care of any varmints on larger properties. These BDC reticles are mostly wasted on lower powered scopes, at least for .308 and larger caliber rifles. The bullet drop is not significant enough at the ranges you are likely to use a small scope for it to be a major factor. Where this changes is with lower caliber or slower bullets. On something like a .22 or .45-70, you can actually get a reasonable amount of use out of bullet drop. For hunting, this has definite applications. Though they may be more rare, reticles like chevrons and circles are probably the best overall option for a low powered scope. They are much faster than any other reticle pattern making them great for any occasion where you may need to get a shot off quickly. This could be hunting or home defense. When combined with the small amount of magnification, even engaging distant targets is faster than with most other sighting choices. For most any purpose you would apply a lower powered reticle too, having illumination as an option is definitely worthwhile. The most common uses for these reticles would be in home defense and hunting scenarios. While it is far from necessary, the option is well worth exploring. There may not be a large number of scope models with illumination but it is more common with scopes of this power than any other. If you can find a scope with this feature, it is often worth exploring as they are often still quite cheap. While most things such as size, weight, and many other factors are fairly consistent among scopes in the 1-6x range, eye-relief is not. There are two reasons you want to make sure your scope has good eye relief and both are vital for the performance of your optic. Because these scopes are far shorter than more powerful models, they may sit farther forward on your rifle. Having a scope that can give you a clear picture when the distance between your eye and the lens will improve the performance drastically. This will depend on your rifle of choice and how mounting works. For most people, this would be a non-issue. A second situation where eye-relief is a paramount concern is when you are using a weapon with a stiffer recoil. If you have never taken a scope to the eye, you have no idea how unpleasant it can be. Get a scope with adequate eye-relief so this doesn’t happen. Not only will it put a quick halt to your day of shooting but it can cause permanent damage. When you look at these low power scopes, it would be hard to overlook Leupold. With over 100 years of experience, they make some of the best scopes on the market without a doubt. Better yet, they are made in the USA and offer some of the best customer service and the absolute best warranty of any optics company. But what makes the Leupold Mark 6 the best? It starts with the glass. The lenses on any Leupold are easily some of the best ever made. They are optically pure, incredibly clear, and thanks to their multi-coat and Xtended Twilight system, bright enough to see in even low light. They even tint the lens edges to avoid stray light that can cause washout. Particular to the Mark 6 is their illuminated reticle system which is bright enough to be daylight readable while not causing blindness in lower light. On 1x you can easily shoot both eyes open for great situational awareness or crank up the magnification to be accurate out to several hundred yards. This is one of the most rugged scopes on this list even with its electronics. The 1-piece aircraft aluminum tube is sealed and purged to keep out water, fog, dust, and any other contaminants. The lenses have an anti-scratch coating. It is built to survive enough the toughest conditions. This is a scope you will have for a lifetime with minimal care. Vortex has taken the shooting world by storm, not only because they produce great quality optics but just by the sheer number of models they have. Not all Vortex scopes are created equal. While all are exceptional, there are several tiers of optics and at the top are the Razor rifle scopes. The Gen II razor in a 1x6 is easily one of the best compact rifle scopes around. It has absolutely phenomenal glass and industry-leading multi-coat technology. This leads to stunningly clear and bright images and with their quick focus eye-piece you lose little to no target acquisition speed. From close to medium range applications, you would be hard pressed to find any faults. When it comes to durability, the Razor is equally exceptional. The scope tube is thicker to keep it more rigid while the whole body is sealed and argon purged. This keeps any moisture or contaminants away from the working parts of the scope. With fog-free lenses and anti-glare, your picture will always be unobstructed. This is an illuminated scope with 11 brightness levels and a mil-hash reticle for easy aiming at a variety of distances. The turrets are low-profile, capped, and can be reset to zero so your aim stays true. Scaled down to no magnification, this scope is quick and on higher magnifications, it delivers consistent shot-for-shot accuracy. For the money, this is simply a great and highly capable optic. While Sig Sauer is best known for its amazing pistols and more recently for its rifles, they have been producing optics for the last several years. With a flooded market, these optics have not received the attention they deserved. Sig may not be a dedicated scope company but their products are top notch and well worth including in your arsenal. The Tango 6 is Sigs answer to the 1-6 power tactical scope and it performs as well as any Sig product ever has. Like any scope in this price range, the glass is about as good as it gets. To really get it over the top, the multi-coat is what counts. Sig has answered that with the HDX Optical System which includes multi-coating on all lens surfaces. This reduced glare while increasing low-light performance. This was designed as a tactical scope but adapts for hunting situations very well. The sheer number of features packed into this scope is mind-boggling. The most impressive is Sig’s MOTAC motion activated illumination that turns the lights on when it spots movement. This pairs with their HellFire reticle system that uses fiber optic on a glass etched reticle to vary the light depending on ambient brightness. Most Tango 6’s are a true FFP scope with smooth zoom and capped turrets. Power operates by a throw lever and ring adjust brightness. Though Sig offers several reticle patterns, the one used for 3 Gun is probably the most versatile. It works well with the scopes intended purpose and design. In the mid-tier of Vortex optics, we find the Gen II Viper PST. While it does stand slightly behind the superior Razor rifle scope, the price is significantly lower making this about the best value in modern rifle scopes. Coming in well under $1000.00, this scope will get you most everything you need and several convenient features that had perhaps not considered. Like its more expensive brother, the optical quality on the Viper is stunning. It uses the same low dispersion ED glass with the same high-end multi-coat. The Vortex XR multi-coat increases light transmission for low light and includes their ArmorTek coating to prevent lens damage. It even actively repels dust. Should that not be enough the Viper has an argon purged tube and O-ring sealed lenses for maximum durability. This keeps the dust out of your mechanism as well as fog and water. The entire scope is watertight and will last a lifetime. Additionally, the Viper has capped turrets with zero stop to keep it on target and a side focus to keep the image clear. It has ample eye-relief for some bigger calibers while staying small enough for more compact rifles. For a midrange scope, something that will fit in about any budget, this is a phenomenal scope. 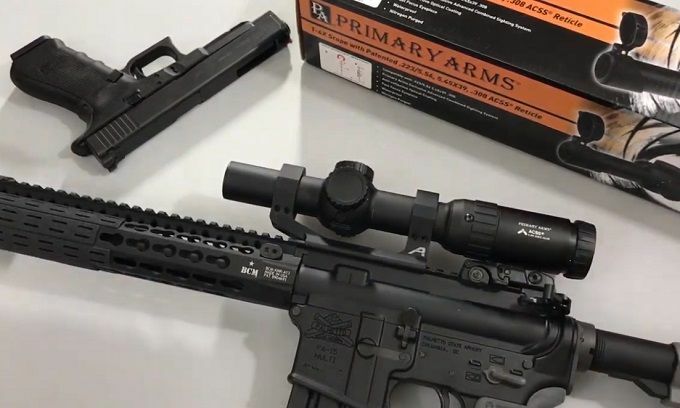 Primary Arms is a company that operates on the same business model as Vortex. They provide great quality optics but for a much more affordable price than the big name companies. They may not be quite the quality of most Vortex but they are close and much more affordable in most cases. If you want a scope under $500, this is a great choice. If there is a fault in Primary Arms it’s the slightly less clear glass used in their optics. While this is not noticeable in most cases, it is there and can have some effect. Most of the issues are countered by the fully multi-coated lenses that increase light transmission, increase brightness, and overall improve the visuals through the scope. All Primary Arms scopes are waterproof thanks to the sealed and purged interior. This also makes them fog proof and resistant to dust. They come with a lifetime warranty in case anything goes wrong but with the immense popularity of these scopes, most of the bugs have been worked out long ago. They tend to run very well for the price. The reticle in this optic a chevron that is specifically tuned to work with 5.56 and .308 caliber rifles. While it will work with most other calibers, you will have the best results with one of these rounds. The reticle is also partially illuminated with 11 brightness settings. This rounds out a very good scope that you can get for a price that is hard to believe. We move on to the third grade of Vortex scopes and though they are less overall quality than the more expensive iterations, most shooters will never notice the difference. In all ways, they seem to perform the same as the more expensive models but if you are harder on your gear, they are a little less durable. When I say a little less durable, it is only a little. All Vortex scopes are water, shock, and fog proof with the same sealed and purged interior. They can take a hard days work. If anything messes up, they have the very same warranty on every model. Some things may slip by quality control on a cheaper scope but they will still make it right. The Vortex Strike Eagle is remarkably close to the other models above. The glass is a little lower quality than the ED prime but is still better than any other scope in this price range. You still get the full multi-coat which makes the sight picture crisp, clear, and bright even in low light. This scope does have illumination identical to the other Vortex scopes and comes with a reticle designed to function flawlessly with the AR-15. It is fast and accurate and perhaps one of the best reticles for a low powered optic. The center dot is all that is illuminated and has 11 brightness levels for any condition. If you are on a budget and want a great scope, this is a very good choice. If you came here looking for a scope under $200.00, Monstrum Tactical has you set with their G3. You do have to understand that at this level, you will be making sacrifices in quality but maybe not as much as you would think. To be honest, it is sometimes hard to identify where the cost savings are for the company. The interior of the scope is sealed and purged. All of the controls and erector are corrosion resistant brass. It even has lockable, zero-reset turrets. These are not usually the markings of a budget optic. Optically, this scope is not the greatest but it does work quite well. In dim situations, the glass can become a little cloudy but it will never fog and is 100% water resistant. There is no lens coating to improve light transmission which makes it a little duller and dimmer. It does have an illuminated reticle that works quite well and is on the first focal plane of the scope. This is a pure value-added feature that increases the overall usability of a budget optic and makes the Monstrum a viable choice if money is a little tight. While you would be better off choosing something with a little more quality, this is a scope you can be proud of. This little scope ends up stuck at the end, not because it is cheap or poor quality. Not that it is even not a good value for the money. It is here because it may be just a little too good in the wrong ways for most shooters. You will need to take into consideration the overall lack of tactical features before you decide on this scope. For those who don’t know, Swarovski is a premium optic, one of the most premium there is. They have long been the choice for serious European shooters and are even used by a number of countries on their sniper rifles. Not this model but the brand in general. If you get the opportunity to look through one of these amazing scopes, you will quickly understand why. The glass in a Swarovski is simply stunning. It is probably the best in the world even without a coating. But, of course, they do use a coating that will make the sight picture so clear it will take your breath away. Even in low-light, your target will shine through this scope. It does have an illuminated reticle and ballistic turrets but they are capped and not easily accessible. The reticle is a simple duplex style that is well suited to hunting but a poor choice for tactical situations. The whole scope is water and fog proof, sealed and purged. But the overall body feels a little less sturdy overall. If you want a scope that is optically perfect, this is it. If you want something more robust and tactical, go with one of the other scopes above. The uses for the best 1-6x scope are many. It is a niche that is missing from too many peoples arsenals. This is a tool that will put your rifle a step ahead in just about any format you use it. It lacks the limitations of high powered optics but is more versatile than a red-dot sight. For the hunter or just those with a tactical mindset, pick one of these up and never look back. They are well worth the cost and you will never want to be without one again.